Since the new Libbey Bowl is a small amphitheater, virtually all of the seats are relatively close to the stage with good sight lines. Lawn seats are also available for those who prefer to spread out a bit. Blankets and beach chairs no taller than 12″ are allowed on the lawn. Lawn patrons with taller chairs will be seated on the right side of the lawn so not to hinder the view of others. Will my seats be in the shade? That depends on the time of the day. A shade cloth is erected to cover a large portion of the audience section, but we always recommend bringing a hat and sunscreen. A jacket or wrap may be needed for evening concerts. How can I learn more about the programs? One hour before each concert, ticket buyers are encouraged to join us for free Concert Insights at the Libbey Park tennis courts. Musicologist Christopher Hailey and featured artists discuss the repertoire and the interesting connections of the music. Comfortable casual wear is entirely appropriate. Since this is an outdoor facility and the weather is often very warm, we recommend a hat or visor and sunscreen. A heavy wrap, sweater or jacket may be desired for the evening concerts. Can you accommodate persons with disabilities? Handicapped seating and restroom facilities are available. A small parking lot behind the post office is reserved during the Festival for vehicles displaying ADA placards. Please call our box office to inquire about the seats at 805.646.2053. We offer college students a special $5 lawn ticket with a current ID. Students can also purchase reserved seats at a 30% discount. Children ages 5 to 17 are $5 on the lawn; children under 5 are free. The Festival does not offer senior discounts. Groups of 8 or more receive a group discount on tickets to a single concert. Call our box office at 805 646 2053 for information. For concerts, lawn seating for children 5 to 17 is $5.00. Lawn seating for children under five years old is free. Children 10 years and under will not be admitted in the reserved section of the Libbey Bowl. Children over 10 receive a 30% discount in the reserved sections. Can I come in and pick my seats? Seating is done by our box office on a first come, first served basis, with priority given to donors and series pass subscribers. Single ticket holders will be seated in the remaining available seats. When purchasing tickets online, you are able to select your own seat. Please contact the box office with special seating requests and assistance. If you’re in the area, drop by our office at 201 S. Signal Street – we’d love to meet you! Will tickets be available at the Box Office on the day of the concert? Perhaps, but since we usually have near capacity audiences, ordering early will ensure the best seating we currently have available. Can I reserve my seats and pay for them when I pick them up? We can only hold prepaid tickets at Will Call. Tickets can be purchased with your Visa, MasterCard, or American Express. All sales are final for tickets and special events. There are no refunds or exchanges. In common with other outdoor venues, there are no refunds in case of rain. However, if you turn your tickets back to us for resale we can issue a receipt to you for a tax-deductible donation in the amount of the value of the tickets. Ticket mailings begin in May and continue until the week preceding the Festival. After that, tickets be held in will call for pick up prior to the concert. What if I arrive late to a performance? Late seating is based on the discretion of the House Manager. Please note that some concerts (noted in the program book) will have no late seating. Will food and refreshments be available? There will be vendors for food and beverages, as well as concessions for gifts, mementos and souvenirs. You may also bring your own picnic lunch and refreshments for the lawn or our Gathering Place in Libbey Park. There is a no alcohol policy in Libbey Bowl. Only service animals are allowed at the concerts. Please call our box office at 805 646 2053 to make arrangements. Parking is available on the streets surrounding Libbey Park and in various lots within a two block radius. All parking is free. Always allow enough extra time to find parking and have a leisurely stroll in downtown Ojai. When should I get there to get the best lawn seats? We open the Bowl one hour before the start of the concert. Subscribers get in first before single ticket buyers. People often begin lining up well before then. Come early, stake out your space on the lawn, and plan to attend the pre-concert lectures given 45 minutes prior to each concert. Occasionally, rehearsals may delay the opening of the gates. Can lawn buyers picnic on the lawn? Yes, please bring blankets to sit, relax and enjoy a meal! As far as lawn chairs, patrons who bring camp or deck chairs are placed usually on the right side of the lawn while lower beach chairs are placed on the left side as well as picnic blankets. Ushers will be available to direct patrons to the appropriate location on the lawn. Can I take pictures of the concert? The use of cameras, audio or video recording devices are not allowed during a performance. 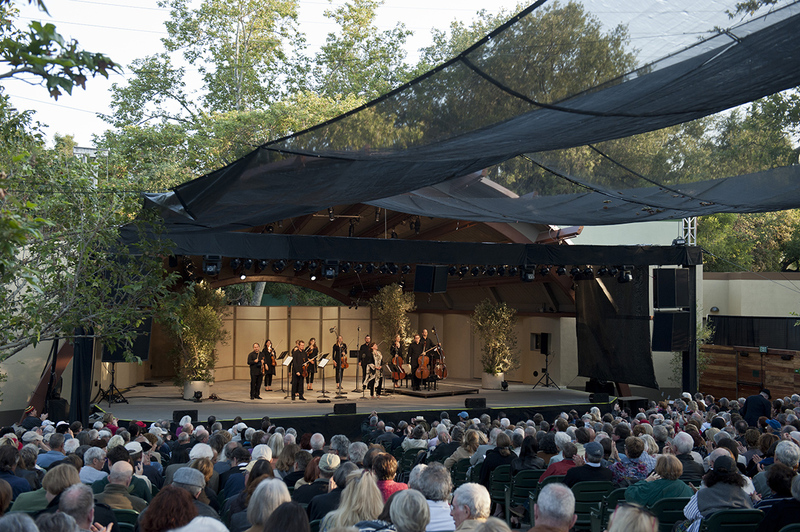 Please contact us if you have any other questions at 805 646 2053 or boxoffice@ojaifestival.org. Thank you!